Central City is the main hub of player activity in the New World and the main hub of the New World MRT System. It was built over the course of 2 to 3 months by MRT Staff in preparation for the Gamma server update. The city is managed by Frumple and MRT Staff and hosts many major events. Central City is served by A0 which is an A-class beltway that runs around the perimeter of the city to provide access to other A-class highways (A1, A4, A5 and A8). B19 to Spruce Neck extends from Morningside Avenue at Kalmar Street while Royal Ferry Freeway to Royal Ferry extends from Hoopsville Avenue at Hill Street. There is direct road access to nearby Sealane via A0. Central City Bus Terminal is located between Inchmuir Street East and Fairfax Street and is served by Cyan Line . It houses various bus services traveling to and from other cities in the server. Central City Bus Terminal managed by CaptainChimpy. Players of the [Citizen] rank and above can place a bus service in the terminal with permission from CaptainChimpy. Central City Heliport is located at Morningside Avenue and is served by Cyan Line . It houses various helicopter services traveling to and from other cities in the server. Central City Heliport managed by godzilltrain. Players of the [Citizen] rank and above can place a helicopter service in the heliport with permission from godzilltrain. A map of transit in Central City. Click here to see a larger image of the map. Central City has 10 stations of 10 of the initial lines of the New World MRT System. All of these lines serve the 4 terminals in Central City. The Central City Northwest MRT station serves the A Arctic, P Plains, T Taiga, and Z Zephyr North MRT lines. Central City Northeast can be accessed via the Plains line, Southeast and Central Park via the Zephyr line, and Southwest via the Arctic line. The Plains and Taiga lines terminate at this station. Additionally, the CentralLink D metro line and 4 bus line stop here. Notable locations nearby include the Subury Center, the northwestern terminus of the Central City tram system, and the Central City Heliport. The Central City Northeast MRT station serves the X Expo East, F Forest, P Plains, and V Valley MRT lines. Central City Southeast can be accessed via the Forest line, Southwest and Central Park via the Expo line, and Northwest via the Plains line. The Forest and Valley lines terminates at this station. This station is connected to the CentralLink system through the A metro line, which terminates here, and 3 bus line. The station is located in a complex that holds the Central City Stock Exchange; a tunnel from the underground Expo line station connects it to other nearby buildings. The Central City Southeast MRT station serves the F Forest, I Island, M Mesa, and Z Zephyr South MRT lines. Central City Southwest can be accessed via the Mesa line, Northwest and Central Park via the Zephyr line, and Northeast via the Forest line. The Island and Mesa lines terminate at this station. The CentalLink D metro line also terminates at this station; connection is also available to the C metro line and 3 bus line. 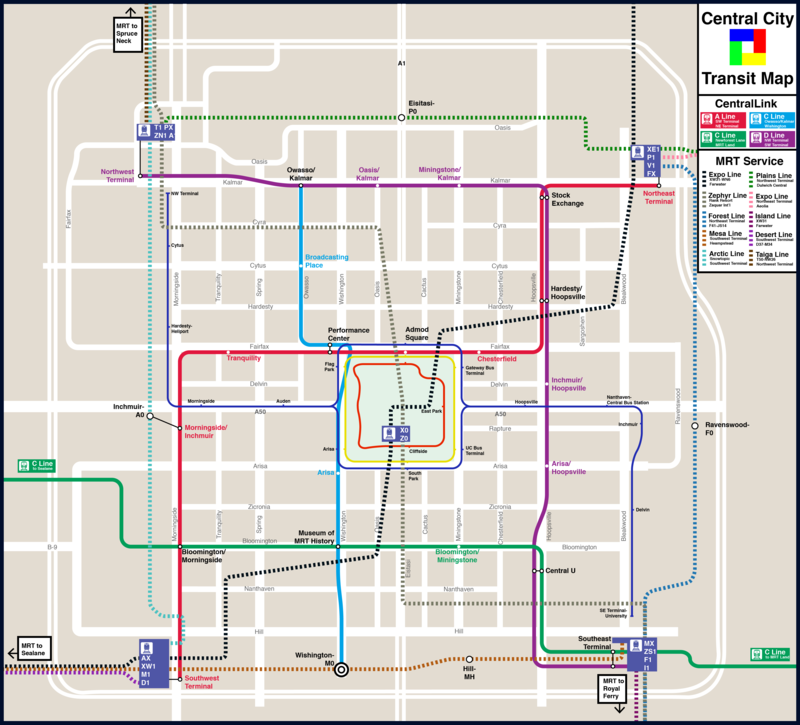 Nearby locations of note include the MRT University of Central City and the Southwest terminus of the Central City tram system. The Central City Southwest MRT station was built by yeamanator123 with landscaping done by lalaboy, and serves the A Arctic, D Desert, X Expo West, and M Mesa MRT lines. Central City Northwest can be accessed via the Arctic line, Northeast and Central Park via the Expo line, and Southeast via the Mesa line. The Arctic and Desert lines terminate at this station. The CentralLink A metro line terminates at this station. Additionally, the station is served by the CentralLink line 4 bus. A Pride Wall is located in the entrance to the CentralLink A line station. The SM Central City, a mall featured in a past shop building competition hosted by Frosty_Creeper10, is also located nearby. Central Park is the default spawn location for new guests and the location that players are teleported to upon using the /spawn command. Only MRT Staff are permitted to build in the park. The spawnpoint at Central Park where new guests first spawn at. The park houses portals to all of the server's worlds (Old World, Lab World, Games World and Space World). The portals at Central Park that allow access to the other worlds of the server. The park houses terminus warps for all lines of the New World MRT System. The terminus warps at Central Park MRT for each New World MRT line. The park houses an underground MRT interchange ( X0 Expo Line and Z0 Zephyr Line) that is connected to the 4 terminals of Central City. The MRT Welcome Centre in the park provides information on MRT History, houses warps to [Premier] cities (Arisa, Airchester, Achowalogen Takachsin, Whitechapel, Kenthurst and Segville) and hosts WorldEdit tutorials. The MRT Welcome Centre built by lalaboy. The park is served by the Circular Line and the Central Park Railroad . The Central Park Corridor serves as an underpass to Admod Square and provides underground access to A Line . Admod Square is located at Fairfax Street directly north of Central Park. The complex houses offices for all Admods of the server. Status indicators at the lobby display the statuses of each Admod via a colour code as well as the Admod's country and time zone, while the Admod meeting room on the rooftop hosts monthly General Staff Meetings (GSMs). MRT Mail Centre is located at Inchmuir Street West directly west of Central Park. The complex houses approximately 180 mailboxes. Vacant mailboxes can be claimed by players of the [Citizen] rank and above to receive mail addressed to them. The Mass Distributor allows mail to be sent in bulk and can be disabled for individual mailboxes at the request of their owners. MRT Library and National Archives is located at Inchmuir Street West directly west of Central Park. MRT Flag Park is located at Wishington Avenue directly west of Central Park. The park showcases grand flags of the various towns of the server. Vacant flag poles can be claimed by players of the Councillor rank and above to hoist the official flags of their towns. Fairfax Street Mall is located at Fairfax Street directly north of Central Park. The mall houses outlets of various franchises such as Kalmar Fried Chicken, CreeperCola, Waffle House, and CherryTech Technologies. Central Stock Exchange is located in the vicinity of Northeast Terminal. The complex is operated by the Central Exchange Organisation. Central City University is located in the vicinity of Southeast Terminal. The university houses the MRT Road Construction Guidelines room and WorldEdit School. Central City MRT Museum is located at Kalmar Street. The museum is currently under construction. Central City Performance Centre is located at Fairfax & Wishington. The stadium hosts various MRT performances and presentations such as the Eagle Awards. Central City Expo Centre is located between Arisa Street and Zicronia Street. Central City Convention Centre is located at Cyra Street East. Central City Public Library is located at Arisa & Wishington. Central City Offices is located between Zicronia Street and Bloomington Street. The complex is currently under renovation. Admod Park is located at Zicronia Street. The stadium hosts various MRT sporting events. The Admod Square. Only staff members can place and destroy blocks inside the complex. The MRT Mail Centre. Only players of the [Citizen] rank and above can enter the complex and claim any one of the unclaimed mailboxes. The MRT Library and National Archives. Only MRT Staff can access the library. The MRT Flag Park managed by Tom_Pairs. The Fairfax Street Mall. Only players of the [Citizen] rank and above can occupy any of the unclaimed retail spaces inside the mall with their franchises. The Central Stock Exchange built by LDShadowLord and _frozen. The Central City MRT Museum built by Gopher. The Central City Performance Centre. The Central City Expo Centre. The Central City Convention Centre managed by Sirots. The Central City Public Library. The Central City Offices managed by Duechayapol. This page was last edited on 18 March 2019, at 23:07.